Reasonably-sized (considering resource, cost, duration) projects have elements of risk, complexity associated with them. Given the way business ecosystems are changing, the challenges to deliver projects have become multi-dimensional. It is not rare to see that project delivery timelines are missed. It is not pretty rare to see that project goals are not achieved or the delivery happens within agreed constraints of cost, timeline and quality. A lot of these deviations are attributed to the risks associated with the projects and inability of organisations to properly manage these risks. Before we jump on to the main topic need of project risk management software, let’s understand the basics of project risk management and related challenges. Of course, project risk management is not any new phenomenon and practicing project managers knows the importance of risk management. Yet the risk management as a domain or as a practice is evolving and many project managers have limited understanding of risk management. involves risk identification, establishing context for the risk analysis, knowing reasons and organisation’s processes of highlighting risks. Here we have to understand that estimating the probability of risk is not easy like step-1-2-3 kind of task and moreover it can hardly be cent percent accurate. Why? Because if the risk can be estimated to such highest accuracy, then hardly it is a risk. Yet companies are using techniques to use qualitative information and have mathematical models to estimate quantitative probability. Many organizations user Barry Boehm’s list of risk item to help its project manager in analyzing risks. Though these risks items are in the context of software projects, nonetheless it will be useful to look at it. Yet there are other such risk importance checklist/item list developed by other researchers. One can check risk management document for further reference. Looking at the research paper and the list of risk items mentioned thereof, one would know that the list is not limited and it keeps evolving. Hence it is imperative for project managers and in turn companies to review risk analysis, risk control and risk response methodologies over the time. There are certain ways that will help you to evolve your risk management processes considering existing and newly identified risk items. It is greatly influenced by the project management methodology, risk management processes, change management processes on one had and on the other hand easy identification and highlighting of risks, accessing historic information about risk & risk analysis. There would be certain project management methodology and risk management processes adopted and practiced by organisation. These can be improved, supplemented by right risk management tool. A right risk management tool will facilitate the second part of the risk management process as mentioned above. This is a crucial step that lets you decide how are you doing to response to a given risk (be negative or positive aka opportunity). Project manager can decide to accept the risk, mitigate it, contingent, transfer or avoid. So Why Do Organisations Need Online Project Risk Management Software Like ZilicusPM? Good number of managers we talked to, have been raising concern about the difficulty, frustration they face in managing umpteen number of spread-sheet versions of risk register. It is funny but I wonder if they have risk recorded, for such risk-management practice itself; where having risk register in spreasheet is a risk in itself. Excel/speadsheet are pretty much like a hammer to every data-set/data-problem look like a nail. 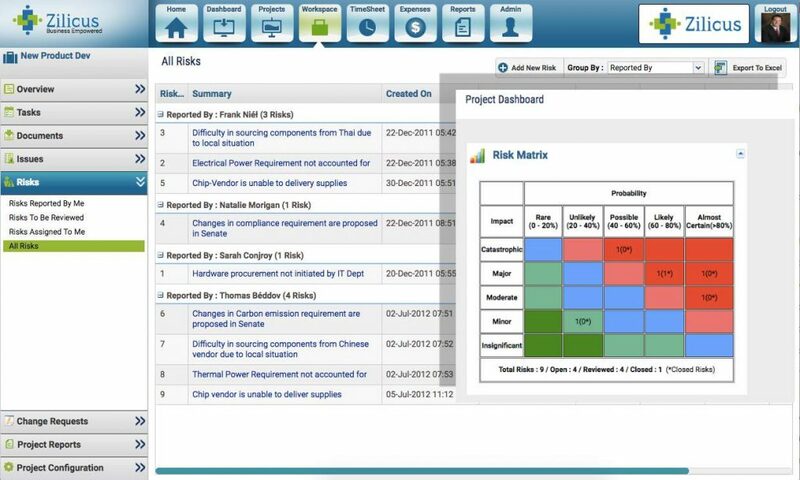 You need a proper, right project risk management tool to manage risk and not a spreadsheet based (inherently non-collaborative) risk register.